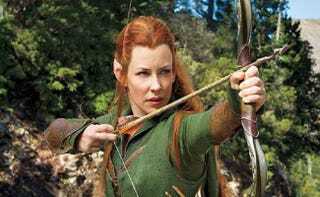 Despite a lot of umming and ahhing over her addition in the run up to the release The Desolation of Smaug, Evangeline Lily's Tauriel seemingly won people over with her Elven wanderlust and combat badassery... but her relationships with Kili and Legolas, less so. It turns out that Lily herself didn't want to be involved in a love triangle either - and originally, she wasn't. ...And then, I came back for reshoots in 2012 and they were like, ‘Well, we made a couple of alterations to some scenes and we added a couple more scenes,’” the actress continued. “And all of a sudden manifested a love triangle before my very eyes and the film was shot and I’m in and there’s no getting out and there was no escaping it. It's a shame that the additions made to Tauriel's character as the film series grew from two movies to three were to essentially adding this romantic element in. I mean, I'm not super down on her character for having this love triangle arc, she's still a great addition in my eyes, but man... more Tauriel being awesome and capable and questioning Elven isolation, and less dwarf/elf/elf romance, Mr. Jackson.